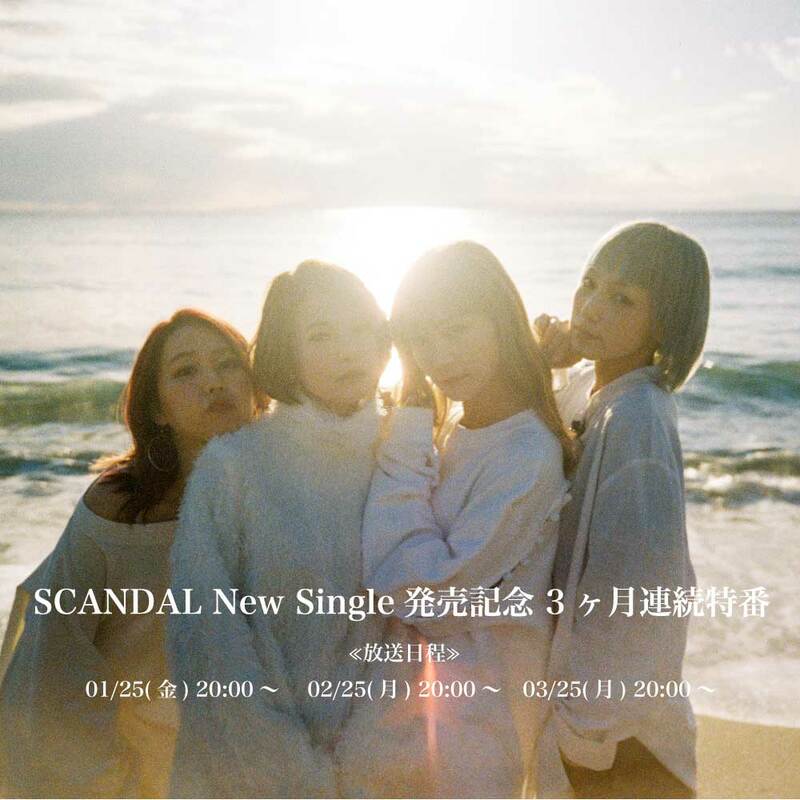 LINE LIVE special programs to celebrate the release of SCANDAL's new single will be broadcast live 3 months in a row!! SCANDAL has established their private record label "her," and to commemorate the release of their new single 「Masterpiece / Mabataki」 (マスターピース / まばたき; Blink), a special program will be aired live 3 months in a row! A new song every month for the next 3 months??? Tuba wrote: A new song every month for the next 3 months??? SCANDAL has established their private record label "her," and to commemorate the release of their new single 「Masterpiece / Mabataki」, a special program will be aired live 3 months in a row! Since they used the "/" (slash) symbol between the two songs, it's possible that this could be a dual A-side single with possibly one more B-side song, which could mean 3 new songs. Or, it could just indicate that the A-side song is "Masterpiece" while "Mabataki" is the B-side song. Either way, there will definitely be at least 2 new songs! They didnt say when the actually release of the single will be, maybe we will get more info this LINE on Friday. I'm pretty sure this was ask before but how can we watch the LINE LIVE, do we have to have a Japanese VPN? Star~world96 wrote: I'm pretty sure this was ask before but how can we watch the LINE LIVE, do we have to have a Japanese VPN? Pretty sure you don't. I don't think anyone here has needed it to watch any of their past LINE LIVEs. Plus, the video will still be up on its page after the broadcast is done, and no VPN is needed to watch that (here's an example). So yeah, just head to the program page when it's time. Not all LINE LIVE shows are archived, so just be aware. LINE LIVE Victor Entertainment channel will also be streaming it, but note Victor Entertainment never archive any of their live streams. I haven't tested myself, but users in the UK said they were not able to view the sign up page for the broadcast, so best bet have your VPN ready and maybe watch it live if you want or see if someone will capture a copy. wildthing wrote: Not all LINE LIVE shows are archived, so just be aware. I, in the US, have been able to view every single SCANDAL-related LINE LIVE program live in the past without ever having to use a VPN. The channel this will be on (LIVE Channel) seems to have a pretty good track record with making videos available after broadcast, too. You can't sign in to LINE LIVE if you're outside of Japan because you can only do so on the app, and the app is not available to officially download on overseas app stores. And if anyone is wondering: No, downloading the app is not required in order to watch the upcoming broadcasts on this specific channel. It only gives you a more direct way to watch LINE LIVE videos and send you reminders of upcoming programs you've signed up to get notifications for. However, you can sign in to it if you really want to. Dunno if it'll work the same for iOS, but if you have an Android, search for an apk of LINE LIVE, download, install it, and you can then sign in using an existing LINE account or Twitter account. I've done this as well and have never needed to use a VPN for this either. Also two more points. Some Line Live stream require you to be a friend on LINE app before you can view it and some streams are only viewable on the smartphone apps. Guess we will know how it will be done after the first stream. I'm in the U.S also, so hopefully I can watch it when it streams. And for anyone living in the eastern U.S. who wants to watch the live when it starts, it will be at 6am EST early Friday. lol yeah, it definitely was supposed to be a surprise until the first stream. I also noticed that in the article about it that SCANDAL retweeted specifically says "The title is TBA." Like was posted previously, it'll most likely be available to watch afterwards on-demand on the actual LINE LIVE page. Everyone should be able to watch it without needing a VPN. That being said, I *might* repost it on our YouTube (SCANDALHEAVEN4), but I'm not sure yet. I'll definitely do a translated summary of it, though, which I'll post afterwards in this thread. Is there a link to the LINE LIVE page?? zigzachzoe wrote: Is there a link to the LINE LIVE page?? Edit: The band just announced that the single, Masterpiece / Mabataki, will come out on March 27th. About "Masterpiece": As usual, lyrics by RINA and music by MAMI. They said they'll only now be recording it = it hasn't been recorded yet = they won't be streaming it during this first program. They did mention that it'll probably be done + possibly the music video too by the next broadcast on 2/25. Three editions: Regular, LE A (Magazine), LE B (T-Shirt). Tracklist will consist of "Masterpiece" and "Mabataki," so there is only a total of two songs. Regular Edition only will have "Masterpiece (Instrumental)." More on the LINE LIVE: It ran for an hour and the band basically only talked about the new single while holding up red boards that had info on it + all related release events. They also did their customary "Valentine's janken (rock-paper-scissors)" where whoever wins at rock-paper-scissors has to buy nice chocolate for the rest of the band for Valentine's Day. HARU had done it last year, and this year it'll be RINA's turn. People asked RINA to tell everyone during the next live what chocolate she ends up giving out. I hope the new group photo they were holding will come as a first press bonus poster. As I suspected no official archive on LINE live, but one of the usual rippers 2xCantarian uploaded it to YouTube he missed first few minutes. Interesting no take down from LINE, last time I attempted to upload a short clip from LINE Live with Rina/Yuho Kitazawa I got a copyright claim and deleted straight away. wildthing wrote: As I suspected no official archive on LINE live, but one of the usual rippers 2xCantarian uploaded it to YouTube he missed first few minutes. Probably because it's rotated 90 degrees and the Youtube algorithm can't detect it right away. Was expecting to hear a new song to day but well, nice to know a new single is coming in 2 months! This recorded stream unfortunately doesn't have the first 10 or so minutes of the broadcast, nor was the stream made available for on-demand playback afterwards. I'll do my best to try and record the two upcoming streams myself! -RINA talks about "Mabataki." They wanted it to be the complete opposite of "Masterpiece" soundwise, and it has a plentiful band sound while also being soft. It has more of a fresh feeling to it than it being a straight-rock number. -HARU mentions how they'll now be recording it. The MC asks, "So...we won't be able to hear it today?" The band laughs and says no as they haven't completely finished it yet. *Note: The MC is supposed to be Nipper, the dog statue in front of the band. Nipper is essentially the mascot/logo of JVC/Victor Entertainment, which SCANDAL's new label "her" is part of. -From memory: Before "Mabataki" they talked about "Masterpiece," which features lyrics by RINA and music by MAMI. -The MC mentions how, since there will be a ton of announcements, they'll be revealing them on boards that the band will hold up. First, TOMO holds up a red board containing the tracklisting and different editions of the single (all info can be found here). They tell everyone to take screenshots of it. The band tells TOMO, since screenshots will be taken, to make "screenshot-worthy faces." -The MC says that they'll now be revealing the covers. The band looks around the bottom of their chairs for boards, but they realize that they're not there and that they'll be revealed on the stream itself. From left to right, the covers go from Regular Edition; LE A; and LE B. The band says in unison how cool they are. RINA starts reading out what people are saying about the covers ("Stylish! ", "So cute! 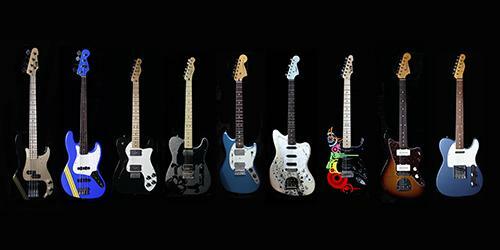 ", "I want all of them! ", etc.). -The MC asks them to speak about how the covers came about. TOMO says how she's been liking and following a collage artist called Q-TA for a while now and has always wanted to work with them. She just put out an offer on the table, like, "Q-TA-san, how's this?" HARU mentions that they asked them to come out to a live show of theirs, and they made live show-like collages for the covers. RINA says that they sent over the collages to them the day after the show, and how happy the band was that they were pretty speedy. The MC infers from that that the band didn't ask Q-TA to make them a certain way. RINA clarifies that they did ask them to include certain nuances, told them what artwork of theirs on their IG that the band likes, and asked them to listen to their songs. The MC then asks if their songs and artwork are usually linked together, and the band says that's exactly on point. -They announce the what's included with each edition. Once again, all info can be found here. They first hold up an approximately 2 ft. sized board with the cover of the magazine that will come with LE A. The content that will be included in the magazine: talks about their new label "her," exclusive pictures, and solo interviews. RINA calls it "A special book packed with various aspects of who SCANDAL currently is." She then reads a comment that asked, "Will it be a different size [than the board that's being held up]?" The band laughs and quickly says that no, it'll be much smaller―more like newspaper-sized. The MC asks what the content in the magazine will be. The band pauses, and the MC repeats the word "content" again. They laugh and say, again, that it'll have their talks about their new label, pictures, and solo interviews. They also mention that there will be a ton of pictures in it. -They move on to LE B, which will come with a t-shirt with the Regular Edition cover printed on it. TOMO holds it up as they exclaim, "So cute!" It'll come in a size L and is on the looser side (more or less equivalent to a US men's M). On the back near the top is the logo for "her." -They then go back over the details for both LEs. They clarify how many pages the magazine will be (36 pages), and while HARU holds up the board again, MAMI points out that it says "Vol. 1," implying that there will be more magazines to come in the future. They pass the board over to MAMI so that it can be seen more clearly for "screenshot time." MAMI starts making faces and the band encourages her to keep up the "screenshot-worthy faces." TOMO then stands up and holds the t-shirt up to her as if she's wearing it, and the band tells her again to make "screenshot-worthy faces" while posing. -The MC asks them to go back over the release details such as the release date, 3/27. The MC says how that day is also Quentin Tarantino's and Mariah Carey's birthdays. The band laughs and goes, "Really?" -The band mentions how it'll be their first single release on a CD in 2 years, 8 months (since Take Me Out, July 2016)―almost 3 years. -The MC says that there are a ton of comments from people saying things like they want to see the magazine/they want the t-shirt. RINA says she's happy that people are this pleased with them. -The MC says, "Speaking of 'Mabataki'...", and the band is handed a pack of shirataki noodles because the words sound similar to each other (lol). -They then talk about which first press bonuses will be available at which stores, and the info is revealed on another red board. Once again, all info can be found here. -On the board it lists that HMV, TSUTAYA, WonderGoo/Shinseido, and "SCANDAL-supporting stores" (AKA other stores that have not been determined yet) will have A4-size clear files. Each store has one "Pattern __" (A-D) written on it, and the MC reveals that "Pattern" refers to a member. That means that the stores will offer a clear file featuring one member on it (AKA a solo clear file). They then hold a lottery to determine which member will be offered at which store. The band is offered a box, and each of them pull out a slip of paper folded in half containing a name of a store. TOMO gets "SCANDAL-supporting stores," HARU gets TSUTAYA, RINA gets HMV, and MAMI gets WonderGoo/Shinseido. To see it explained more plainly, all info can be found here. -Next, they discuss another "pre-order bonus" where whomever purchases the singles between 1/25 - 3/10 at a selected list of stores will receive a bonus A4 clear file. This will have all 4 members on it. Once again, all info can be found here. The MC makes a mistake with the year and says "2009" instead of "2019." The band catches it, laughs, and says, "That was 10 years ago!" -The next thing up is the "TOWER RECORDS one-day store manager event." Once again, all info can be found here. They will be determining which member will go to which store on the next live stream. -They then announce the release events ＜Bakuon Shichou-kai (Explosive Listening Party) at Kawasaki CLUB CITTA'＞ & ＜Hohoemi Zadan-kai (Smiling Round-Table Discussion) at Abeno Q's Mall＞. Once again, all info can be found here. "Bakuon Shichou-kai" will be held at the live house CLUB CITTA', and everyone there will listen to their new songs with an explosion and have fun with the band. This will not be a live performance, but will be a live show-like listening party where everyone can get pumped up while listening to the new songs. "Hohoemi Zadan-kai" in Osaka is the pair to the listening party where everyone will have a smile on their face (or at least grin). RINA says that they will probably talk about things you won't hear anywhere else. HARU and RINA trade places with TOMO and MAMI and hold up the info boards for people to screenshot. HARU, holding the "Hohoemi Zadan-kai" board, is told by the other members to smile. -They ask people for questions. RINA starts answering questions. Her first reply is that all of the members are wearing street clothes. -Q: "Will you be releasing a DVD?" -T: "In the future we will." -R: "We need to have it filmed." -H: "We have no plans currently." -Q: "Whatever came about with GOTO of comedy trio Yonsentoushin? -Backstory: Last October, SCANDAL made an appearance on a show last October where they surprised GOTO, who loves the band and especially TOMOMI. He was encouraged to invite her out to eat as friends, to which she said yes to. The other people on the show then tell him to get her contact info. Back to the LINE LIVE: TOMO says he hasn't contacted her. RINA mentions that they did attend a live show of theirs afterwards, though. TOMO says that they had exchanged info before that and how he said that that day [they taped the TV show] was the happiest of his life, and that she was thankful for that. After the stream, she tweeted that GOTO did end up contacting her. -Q: "Did you buy your customary Valentine's chocolates?" -Each year the band does a customary "Valentine's janken (rock-paper-scissors)" where whoever wins at rock-paper-scissors has to buy nice chocolate for the rest of the band for Valentine's Day. The band asks if it's okay if they could do it right then, and the staff replies that it's fine, of course. HARU had done it last year, and this year it'll be RINA's turn to give out chocolate. -H: "We have a tour [the MANIA tour in March/April]." -Q: "What will the MANIA tour be like?" -They think it'll be a lot of fun. RINA mentions that in the past each MANIA member in attendance had been allowed to bring one non-member with them, but this time only MANIA members are allowed, meaning each person attending must be a MANIA member―a true MANIA event. As such, this will probably be a tour where no one can predict will happen. -They then talk about their first performance of the year: Victor Rock Matsuri 2019 in March, which will be their first time performing there. RINA says that they didn't appear at many festivals last year, and that this year they'll be occasionally appearing at them. They also mention that they'll be appearing at ARABAKI FEST.2019 in April, and that they got such a good response when their appearance was announced. -The MC asks them what they'll announce for the next stream. They say that they announced quite a bit today, but next time they'll be announcing which members go to which stores for the "store manager for a day" event...and that's all they can really think of. The MC/Nipper says that he'll think of something. HARU says that they'll only now be recording both "Masterpiece" and "Mabataki," and possibly the music video too, which might be done by the next stream. -People ask RINA to tell everyone during the next live what chocolate she ends up giving out. -They ask the viewers if there's anything they want to see next time and RINA starts reading through the comments. One viewer says that they can't wait for the music video. Another viewer says that they got married today; the band says congrats and claps for them. TOMO: "If we had a wedding song we'd sing it!" MAMI: "Sorry about that!" -The MC says that there have been people wondering if could hear a little bit of (at least one of) the new song(s) during the next one. They say possibly! -A viewer says, "Please cheer me on as I take a college entrance exam!" The band tells them to do their best + fight on. TOMO says she's never taken one, but she's sure it's nervewracking. MAMI mentions how the Center Test is sure to stress anyone out. -RINA: "Tests didn't make you nervous, do they? Weren't you nervous for your high school one?" -HARU: "What about you, RINA?" -RINA: "I was so nervous! Seriously. I was shaking. My hand was shaking as I was handing it over." -RINA: "Due to having to appear in front of everyone." -RINA says that a lot of girls are asking what brands their clothing are, and to announce them next month? They laugh and are like, "Next month?! That's a month away!" -Q: "Are you coming out with new Feedback! items?" -A: "We will! We're making them now. They're really cute." -The MC goes over a few things for next time: Waiting for the new songs, there might be new info to announce, determining the "one-day managers event" member designations and how they'll choose them, and perhaps some things that the viewers have commented. -R: "We've never done acapella, have we?" -T, M, H: "We haven't." -T: "We could probably do it." -M+H: "It's pretty hard to do." -T: "You have to have a good technique." -S: "We did it when we were attending dance school." -They talk about how MAMI is good at "Mabataki-ing" (blinking), and she goes up to the camera and starts blinking rapidly. -A viewer comments about the abundance of English being used ("Masterpiece," "release") and the band tries to translate them to Japanese. "Release" = "発売" (hatsubai). The band thinks about what "masterpiece" would be, and TOMO comes up with "とても大事な欠片" (totemo daiji na kakera; literally translates to "very important pieces," but that's not exactly what "masterpiece" means in English lol). RINA says "傑作" (kessaku), which does translate to "masterpiece," but they say that sounds harsh. -Another comment says to do the "Mozzarella Cheese Game." The band has no idea what it is, but a staff member off-camera seems to know it as the band gets surprised and goes, "Eh, you know what it is?!" They tell the band and they start to call out "Mozzarella cheese!" They decide to do it for real, starting from TOMO. When it gets to RINA, she says it even softer than HARU, and everyone chides her for saying it that softly. RINA can't stop giggling, and MAMI comments that the game's over now. -The MC says how there's also the "Aishiteru Game" (one player keeps saying "aishiteru" to the other player, and whoever laughs or gets embarrassed loses). RINA says that'd be impossible, and HARU and MAMI laugh and say it'd be impossible for her. The MC says that you lose if you get embarrassed. -T: "You mean if your face turns red?" -H: "You can't make a noise like 'hmph'?" -R: "Wow, that kind of game exists, huh?" -M: "No! I don't want to!" -T: "It'd be hard to win against HARU." -S: "There are so many of these games!" -M: "*reading comments* What's an 'Earphone Gangan Game' (It's kind of like the Whisper Challenge)?" -T: "Everyone know what these are!" -R: "*reading comments* 'Kashi Nottori (lyrics takeover) Game'(First person sings lyrics and the next person has to sing lyrics that start with the last word used)"? -M: "*reading comments* What's the 'Nanja Monja Game'?" -H: "It's a card game, isn't it? There are a bunch of weird characters in it, which you give nicknames to when they're drawn. If a character that's already been drawn and named is drawn again, someone has to shout out what its name is." -R: "You have to remember them?" -They start to wrap things up. They mention how all of those games listed sound interesting. MAMI: "I have no idea what any of them are!" -HARU goes over all things announced today, thanks everyone for tuning in for this hour, and to enjoy next month's and the following month's streams. The band starts saying "Mozzarella cheese!" softly. -The MC asks the band what "her" is about, and asks TOMO to answer it. -T: "'her' is our freshly established new record label." -MC: "That's a surprisingly ordinary explanation." -T: "Eh, I can't explain it in detail!" -MC: "I expected too much." -H: "*to TOMO* What were they expecting?" -T: "No idea! So scary!" -R: "Talk about bad compatibility!" -RINA is handed a phone and starts reading comments ("Congrats on your new label"). -The MC asks if that earlier "explanation" of "her" was okay. The band says a little more about it. -H: "It'll be from this spring onwards." -R: "It's a private label, meaning that it's SCANDAL's only record label. We'll be putting out all sorts of work on it such as new songs and videos." -They announce a contest where the top 3 users who give the most support gifts (digital gifts you buy with LINE coins) on the stream will win signed "her" stickers. -They then announce that their new single will be a double A-side one, then the release date, and finally the title. -RINA discusses "Masterpiece": "We debuted this song at a few of our live shows last year. We hadn't announced the title yet, but there were many people who heard the song. It's a punkish, cool, speedy song. I wrote the lyrics while MAMI wrote the music. I think it'll be a killer tune at future shows. A really cool song. It's a starting song for us." -RINA discusses "Mabataki": "I wrote both the lyrics and music. It has a feminine, sweet mood to it, and also has a bit of sensuality. It's a pretty feminine song." @thoseguiltyeyes This is such great great work of you! I can't imagine how much effort you spent on the translation of a hour long broadcast. Much appreciation! Without this we non-Japanese speakers learn from the stream is close to nothing. I agree 100%, SCANDAL-HEAVEN would not be the same without her, such dedication. Salute to the SCANDAL Heaven Angel: Jade! And that's where the first upload that was posted starts off! LINE LIVE ＃2. Will try and get a translated summary done soon.